Maricopa County Sheriff Joe Arpaio faced a tough crowd and had a tough night Monday. 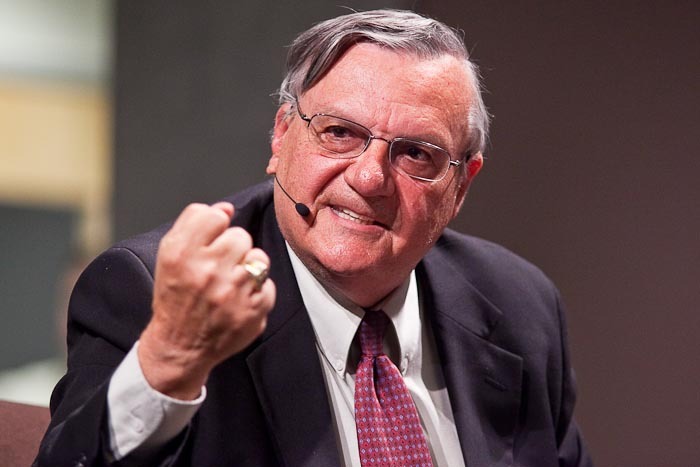 “America’s Toughest Sheriff” sat down with three faculty members (and former journalists) at the Walter Cronkite School of Mass Communication and Journalism at Arizona State University for what ASU officials called a “Meet the Press” type interview. While the former journalists grilled the Sheriff, protestors (both for and against the Sheriff) outside shouted at each other. 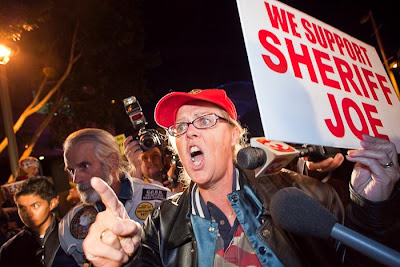 The anti-Sheriff protestors were able to make themselves heard inside the building. 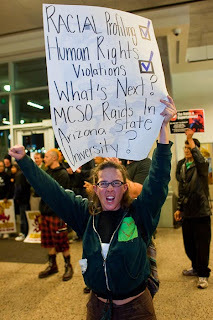 Arpaio was his usual self. He refused to answer some questions (citing pending litigation) and bobbed and weaved like a seasoned pugilist on others. It was vintage Sheriff Joe. He didn’t answer questions he didn’t want to and blamed the media for the problems his department is facing. About 45 minutes into the one hour program, things turned nasty when a group of ASU students started singing (Queen’s “Bohemian Rhapsody” of all things), effectively drowning out the evasive Sheriff. People who wanted to hear the Sheriff started shouting at the impromptu a capella choir and tempers flared. The program ended early as the Sheriff was escorted from the stage. The Sheriff’s opponents treated this like a victory. But really the only winner was the Sheriff. He managed to walk away from some hard questions without answering them and emerged from the evening as the victim, a card he will no doubt play in future media appearances. The photos from top: Sheriff Arpaio makes a point during the interview, a pro-Sheriff protestor shouts at an anti-Sheriff protestors outside while, inside, an anti-Sheriff protestor celebrates his early departure. There are more photos available from ZUMA Press and in my PhotoShelter archive.